One of the surprising things about researching a new dictionary design was to discover just how little it had changed – on a macro level – over the last 250 years. There is quite a difference in feeling between Samuel Johnson’s Dictionary of 1755 and today’s Collins English Dictionary, but the structure of information and the way in which it is made visible are identical. The two- or three-column grid with its three-letter column headers, the outdented headwords, the cascade of entries and quotes; all these are familiar elements of contemporary dictionaries. 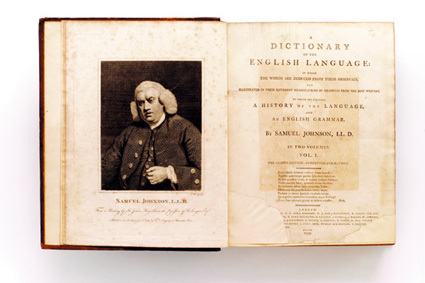 Samuel Johnson A Dictionary of the English Language. Headwords and entries 10pt; quotations 7 pt. On a microtypographic level however, there are some differences. Dr Johnson’s compositor didn’t have a bold weight to separate headwords from entries, or a sans serif for related words; instead the hierarchies were expressed through capitals, small capitals, changing sizes and italics. Although the word count is about the same, the new dictionary reflects a general tendency towards use of lower- or upper and lower-case forms for headwords, in a bolder and often sans serif type, slightly larger than the entries, instead of varying between capital, roman and italic forms at the same size and the same weight, with detail expressed by a reduction in size. Minimum type size is also a very interesting question. It might be assumed that better glasses and contact lenses would lead to a greater capacity to read small type, yet some of the historical dictionaries and bibles I’ve seen contain type that is extremely small by any standards. A dictionary like the Collins Household Dictionary of 1859 is quite difficult to navigate and read, with its 6pt type, lack of differentiation in weight, and column rules.